Even two decades later, journalist Richard Preston is still best-known for The Hot Zone, a mesmerizing account of deadly viruses run amok. A few follow-ups, including The Demon in the Freezer and the novel The Cobra Event followed; his collection of non-fiction pieces was even titled Panic in Level 4 as a nod to his best-selling work. But Preston’s bibliography is more diverse than just deadly viruses, and 1987’s American Steel is a good demonstration of his versatility in telling us about the renewal of the US Steel industry as exemplified by the construction of a Nucor facility in Crawfordsville, Indiana. Preston was allowed access to the site as it was being built and tested; no insignificant achievement as the “Crawfordsville Project” tried to build a new kind of facility at a time where few were willing to even bet on the company’s chances of success. The history of US steel-making, explains Preston, is one where gigantic steelwork operations were gradually replaced by nimbler, smaller competitors. The “mini-mills” led by technological innovation, a willingness to deal in smaller profit margins and a belief that they could do better jobs if they specialized in specific market niches. The Crawfordsville project was one of those status-upsetting move; an American company using German technology to develop a machine that could transform rusting carcasses into shining new metal. One of the most surprising facts from American Steel, especially to 2011 readers, is the blanket statement that over half the steel used in the US in the mid-eighties was recycled. (This figure has since gone up significantly.) Newer steelworks don’t refine iron ore extracted from the ground as much as they recast existing iron in newer forms; the Crawfordsville location was selected in part because it was geographically located close enough to the ruins of the “rust belt” and amply served by train lines carrying recyclable metal. But machinery is far from American Steel’s only concerns, especially not when steelworkers prove to be such memorable characters. It takes a special kind of man to work in a steel foundry, explains Preston; trying to manipulate hot steel with cold steel is a bit like building a water machine with ice, except that renegade hot steel tends to explode, melt human bodies and destroy buildings. Working in such facilities means always being ready to run outside at a moment’s notice, breaking bones after jumping down platforms if the alternative is being burnt alive. Those steelworkers are the focus of the book, and hanging with them as they work hard and party even harder becomes one of the Preston’s ways to involve the reader with his subject matter. You would think that presenting a corporate history of parent corporation Nucor would be relatively dull in comparison, but that’s not considering the tortuous road taken by automobile manufacturer REO (as in “REO Speedwagon”, the O of REO also standing for “Olds” as in Oldsmobile –it’s a complicated story) as it transformed itself in a Nuclear-focused company (hence “NUclear CORporation”), then as a holding company for various ventures before realizing that the best profits were to be made in the steel industry. Nucor eventually became one of the most aggressive of the US steelmakers that renewed US steel production. What contemporary readers know is that the electric arc furnace-driven mini-mills as exemplified by Nucor did manage to remake the US steel industry to their image: Once-mighty corporate behemoths such as blast furnace-powered Bethlehem and U.S. Steel have closed down, bought by mini-mills or been restructured in smaller entities. There’s a darker side to Nucor’s success in its opposition to labour unions, but Preston also portrays a corporation with few management perks, a strong emphasis on humane working conditions and no layoffs to date. The safety of Nucor’s plants is disputed throughout the book; a spectacular blow-out with fatal consequences at the Crawfordsville plant is discussed in one of the last chapters. 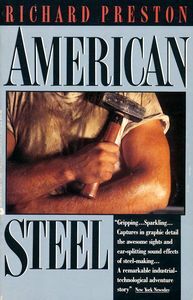 While the book isn’t perfect (some of the dialogues are so steeped in steel-making jargon that they give a flavour of the workers but no real understanding) and could now use at least one updated afterword to bring us up to speed with the latest developments regarding the industry, American Steel is a fine and gripping non-fiction account of a fascinating and dangerous industry. Considering our reliance on steel produced in facilities just like the Crawfordsville plant, it’s not a bad idea to pay attention to those kinds of things. It’s not required to have read the first two volumes of what Richard Preston calls his “Dark Biology” trilogy (The Hot Zone and The Cobra Event) in order to appreciate The Demon in the Freezer, but it does help. While this book isn’t, strictly speaking, a sequel to The Hot Zone, it does exist in a very similar context and features a number of the same scientists as characters. In The Hot Zone, Preston studied Ebola, an exotic disease that may, someday, cause a widespread epidemic. In The Demon in the Freezer, he takes a look at another disease, one that has already killed more humans than anyone can count: smallpox. In many ways, it’s an even more interesting subject than Ebola. I’m part of the first generation that never had to worry about smallpox: Thanks to worldwide efforts by the health community, the disease was eliminated in 1975, the year I was born: Doctors vaccinated entire populations, setting up “firebreaks” the once-rampant disease couldn’t infect. Safely contained, smallpox burned itself out and disappeared from Earth in one of the most significant public health victories in humankind’s history. Officially, existing stocks of the disease were consolidated in two places: Atlanta’s CDC and Vector, a research facility on the other side of the Iron Curtain. Officially, all agreed to keep copies of the virus “just in case”, maybe for developing better medicines. Officially, that’s where the trail end. Unofficially, this is a much spookier story. Evidence exists that, the lax state of Russian security being what it was in the 1990s, copies of the virus have been made, replicated and tested… maybe even sold to other countries, or stolen by agents of these countries. Given the extremely contagious nature of smallpox, the most paranoid virologists have long dreaded an engineered strain of a disease with smallpox’s transmission characteristics coupled with the devastating effects of, say, Ebola. The supreme irony being that the virus is still out there, waiting to be re-used. This demon still awaits in the freezer. In the book’s perfect concluding paragraph, Preston notes that “the virus’s last strategy for survival was to bewitch its host and become a source of power.” [P.283] In this post-2001 age of anthrax letters and hyper-terrorism (all covered in here), who’s to say what’s next? Nevertheless, it’s good (and entertaining) to be swept along by Preston’s prose. With his novel The Cobra Event, he confirmed his talent for writing a compelling narrative and many of the tools he used then are repeated here: Smooth transitions from exclusive interviews to historical narrative, powerful anecdotes and a careful arrangement of material. I find it regrettable the the paperback edition of the book doesn’t include an index (a general flaw of non-fiction books that bothers me more and more with time), but you’d be hard-pressed to find a more reader-friendly pop-science book on the subject. It’s splendidly entertaining, more than a little scary and unbelievably gripping. With The Demon in the Freezer, Preston scores a solid third hit in a row; I wonder what’s next on his publishing schedule.